Microsoft rocked the stage in New York today: it unveiled an impressively innovative new family of products with a surprisingly lively (sometimes a bit over the top) presentation. 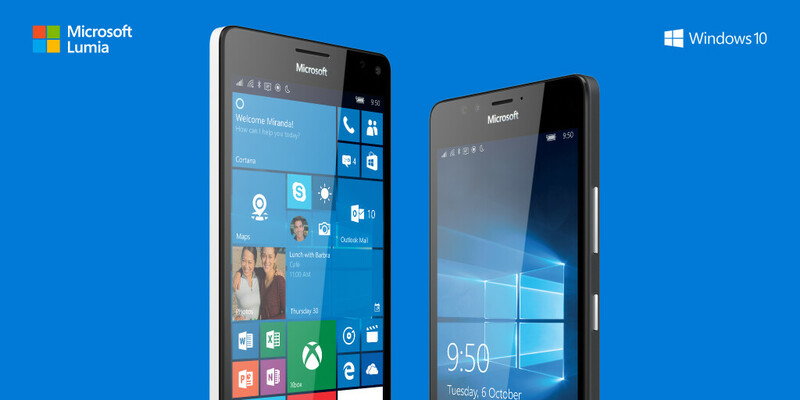 The two devices we care most about here at PhoneArena are the new Microsoft Lumia 950 and Lumia 950 XL, the new premium Windows 10 handsets. In a strategy reminding us of recent developments in Google's Nexus, the Lumia 950 and Lumia 950 XL are of the same kind, but of different sizes. The Lumia 950 is a 5.2-inch phone with the Snapdragon 808, while the Lumia 950 XL is a 5.7-inch handset with the Snapdragon 810 system chip. We've already dissected the specs in various comparisons and in-depth articles, but what we want to focus on here is the pure size: how big are the new Lumia 950 series phones? It turns out: they are quite compact for their size, even surprisingly so. We first start by comparing the 5.2" Lumia 950 to the top dogs in its size class and then continue to see how the 5.7" Lumia 950 XL compares with important phablets. Take a look right below. That's nothing to be surprised about. They pretty much have the same bezel as most other Sony, Samsung, moto or lg phones. It's 2015, I don't expect any OEM to make htc like bezels. Well, Apple uses their huge home button, so it isn't possible for them to reduce those top and bottom bezel. However, the side bezel can be, and will be improved next year. Note 5 has noticeably smaller bezels and more ergonomic. No, Microsoft hasn't caught up to other OEM's in this department, but for performance, battery life, camera, and OS features with W10, they've more than caught up. thanks Godddd. They didnt made it slimmer. Big battery is always welcoming as compared to slim size with small battery. I am not getting it that how 950xl is less taller than note 5 but note 5 has more screen to body ratio? is it due to bigger side bezels on 950xl? HTC's bezels is due to it's dual-front stereo BoomSound speakers! no other one beats it!!! BTW when will they give Windows 10 mobile update to Lumia 930?? Does anyone know the estimated date? th2 is scheduled for november. so i say wait until november. also... you can install the preview om your device. unlike porting lollipop or marshmallow to unsupported phones, EVERYTHING WORKS on the windows 10 preview. stay on the slow ring for stability. i'm in the fast ring though. life on the edge. this 920 is old anyway. Yes the Surface Book is a beast. Teh fact the Surface 4 is 50% faster than an Air, for basicallyy the same costs, blows my mind. But OMG, when they showed the Surface Book before he brought it out, I thought I was gonna pee on myself. I mean, I had a chill go up my spine you wouldn't believe. All that talk about no other OEM can match or even beat Apple standards on design? Microsoft and Samsung have shown they cant one up Apple. It doesn't matter how many they sell. What matters is they are doing it better in lots of ways. The Surface is what PC OEMs could have done ages ago and ruined the dream of Bill Gates. if they had done this with Windows XP Tablet edition, the iPad would have never stood a chance to be what it is today because no fool would have bought such an underpowered non-productive device for $499 when they could by now had a full PC at that cost. Maybe yesterdays engineering would have made such a PC to expensive and that is why. But now, that is no longer the case. thats kinda rude. Whats wrong in expecting something phenominal? if he choose to criticise BIG.little then let him do that. No one can develop their personal architecture without having a team of engineers and testing facility. And this is the reason, he is expecting high from arm and qcomm. Otherwise he might develop something of his own without expecting anything from others. Not my intention to be rude, man.. I just don't get a pointless bashing..
Not my intention to be rude, man.. I just don't get a the point of a bashing just based on a mere personal prefence. Either take or ditch, with no critics -- that's being gentle! hahahahaha... there is no problem with these chips. the overheating issues are mainly exaggerated. otherwise you would be hearing videos and videos and videos of people complaing about the same thing. but you dont. even the z5compact video wasnt about overheating... pa did it for clicks.